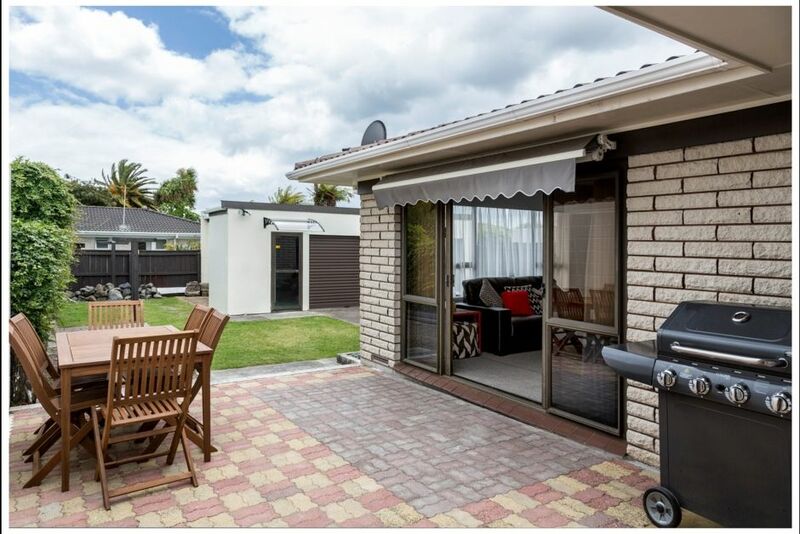 This Town House has been remodelled by the owner to make it an attractive and purposeful rental, offering all the home comforts for people coming to Rotorua, wanting a central and quiet location in a good area (Glenholm). A HUGE PLUS IS THE FANTASTIC THERMAL HEATING RUNNING THROUGH RADIATORS ENSURING YOUR WARMTH AND COMFORT. The living spaces are large, the lounge is approx 5m x 6.5m, it goes through to a well equipped kitchen with the dining area adjacent. The lounge leads out to a paved area with the BBQ and an outside table and chairs. An LG 70" Smart 3D TV can be used in conjunction with Laptop, Tablet or Smart Phone. TV has NETFLIX (and Freeview) channels. The LG 50" 3D Smart TV is in the large 4 person bedroom. The Master bedroom has a Super King Double and two bedrooms have Queen Double beds. The 4th bedroom has two Super King Double beds. All Super King Double beds can split and be made up into two King Single beds as per your requirments before you arrive. Quality linen and bedding ensure a comfortable sleep. There is one inside bathroom and a second one off the paved patio that also has a washing machine accessible from the kitchen. The outside double garage has an extra toilet, is also thermally heated, has heaps of space for your mountain bikes, golf clubs or 2 cars. The location of the property is excellent and there is a block of shops including a dairy/store, bakery, the best fish shop in Rotorua just 300m up the road, with 1.8ks to the New World, and 1.3Ks to the Central City Mall. This property ticks all the boxes! ALL OUR PROPERTIES ARE MONITORED CHEMICALLY and ELECTRONICALLY FOR ANY METHAMPHETAMINE COOKS OR SIMILAR UNSAVOURY ACTIVITIES! SMOKERS OUTSIDE ONLY AND PLEASE PICK UP YOUR BUTTS. THIS IS A NO PETS PROPERTY THANKS. THE PROPERTY IS LIMITED TO A MAXIMUM OF 10 PEOPLE ONLY. THERE MIGHT BE SOME FLEXIBILITY WITH CHECK IN AND OUT TIMES DEPENDING ON ARRIVALS OF GUESTS. CHECK WITH THE MANAGER. Eat Street in Tutanekai St central city runs a food market on Thursday nights with all sorts of ethnic foods available and definitely worth a visit. There is also a Farmers Market at Kuirau Park on Saturday mornings running until midday offering all kinds of fresh produce including meats, seafood, vegetables and ethnic cooked foods! If looking for a movie there are 2 theatres in Rotorua, Reading Cinemas, and The Basement Cinema….this one also has a cafe and a climbing wall. It’s a quaint little picture theatre with 2 cinemas running each holding around 20 patrons. The local Golf Clubs are Arikikapakapa about 1.5ks from you, Springfield about 3ks, and Lakeview about 10ks. All are of a good standard. Thanks again for your great location! Second time our team is staying there and it's always a pleasure! Keep up with the great work!! Cheers! Wev look forward too welcoming you back again for the next event!! We were two mums attending a swim meet with our daughters. Perfectly located being close to the pool and city centre. It was very hot though and no air con or fans. The housekeeper was very accommodating allowing Us to check in early to feed the girls before heading to the pool. Fast internet, advanced TV, full kitchenwares, big house and good for family. One improvement is to clear the two big garbage buckets before check in as they were full attracting many flies. Lovely home, way easy for 10. 2 families stayed easy. Rooms are clean showers and toilets cleaned! Awesum home. Kids room, had 4 singles and there own tv, other 3 rooms had super king bed & queen beds. Hot atm, so best to take a fan maybe during summer. No aircon in the property but that’s ok, left the windows open. Awesum for our needs! Very close to Rotorua Stadium where we needed to be. Thaaank You for having us, we’ll be back soon! We were very happy with the size, layout and cleanliness of the house, the great communication, and the owner's flexibility when we had a slight change of plans. Recommended!